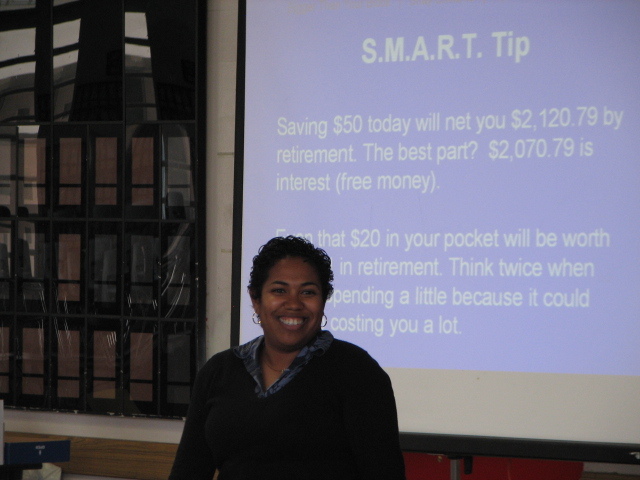 Shay shares a tip about saving early and often at Hoover HS in San Diego. Shay talks about how amazing credit unions are at Hoover HS. Students love talking about credit unions! Who knew? One of the central tips Shay talks about is knowing the difference between a bank and a credit union. Many of the student mentioned that they learned more about what credit unions are and how they can use them. If you’re considering a credit union, check out “Are You a Good Fit for a Credit Union?” on FoxBusiness.com. Two students from each seminar won books from Shay Olivarria. At each seminar, two students won copies of “10 Things College Students Need to Know About Money“. You should have seen them scrambling to find the winning ticket under their chairs. It’s really great to see students excited about learning personal finance tips. Talk about a complete speaker! Shay is amazing! Want to know more about Shay? Visit www.BiggerThanYourBlock.com. Book Shay to speak at your event today (323) 596-1843. The most dynamic financial education speaker working today, Shay Olivarria, was quoted on Fox Business in “Are You a Good Fit for a Credit Union?”. As usual, Shay is a strong advocate of credit unions. Her quotes are centered around the benefits of using a credit union for college students. While a handful of large, well-known banks appear to dominate the banking landscape, and smaller community banks are often touted as the only alternative, the truth is that there’s a third option used by more than 91 million Americans. Credit unions are becoming increasingly popular, and with more than 7,000 of them across the U.S., consumers have a lot of choices. But is a credit union right for you? Consider these five types of consumers who routinely join credit unions. Even if they had a checking account or savings account as kids, most college students are still relatively new to managing their finances. Oftentimes, that means they don’t get the best deal from banks, says John Iglesias, CEO of Salal Credit Union in Seattle. “College students often don’t have much of an income or an extensive credit history, so larger financial institutions may characterize them as risky, and that likely means higher fees on products,” Iglesias says. According to Iglesias, some credit unions are specifically set up by schools for students, and their business model is geared toward working with younger customers who might not keep a very high balance in their checking account. 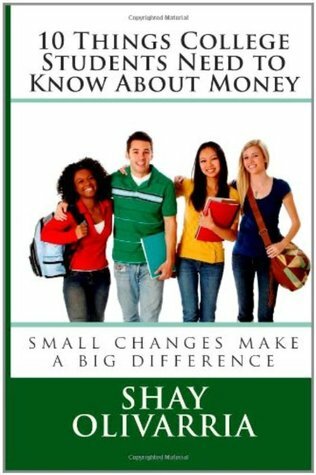 But Shay Olivarria, author of “10 Things College Students Need to Know About Money,” says credit unions also offer a real advantage to college students because they can be more forgiving if you make a mistake. “There’s a focus on financial education with credit unions, and college students have more of a support system in terms of learning about money,” says Olivarria. Financial education speaker and author Shay Olivarria at Hoover High School 2010. I’m thrilled to be presenting “Money Tips for Seniors” at Hoover High School in San Diego, CA this Friday! I love, love, love helping prepare seniors for the “real world”, but this school is extra special because I graduated from Hoover waaaaaaay back in the day. This will be my second year speaking at Hoover. If you’d like to book Shay to speak to your group take a look at her one sheet and contact Bigger Than Your Block, LLC at (323) 596-1843. I’m so glad that I had the opportunity to be a guest on Black Teen Empowerment Radio with Scotty Reid and R. Lee Gordon. We talked about community economics, recycling the Black dollar, the difference between traditional banks and credit unions, types of accounts, and a few tips from my book 10 Things College Students Need to Know About Money. Yesterday, I had the wonderful opportunity to be interviewed by Chandra Adams and Charles Chatmon on Authors in Focus. We talked about my financial education work speaking to students across the country, 3 things every college student needs to know about money, why credit unions are so awesome, my trip Cross Country in a Ford last year and my new book All My Mistakes: Money tips for kids in care. My segmented included an interview with mystery novelist Gary Phillips who has written more than 12 novels. Everyone was really nice. I loved meeting the other authors and learning a bit more about the Hosanna Broadcasting Network where the show will air. Authors N Focus will now been seen on the Hosanna Broadcasting Network (Channel 20 on the Disk network and Direct TV channel 20). Check it out when you get a chance.